In a sense, the middle to the end of summer is my favorite time for eating. Although you can buy seafood any time of the year; fish seems fresher in the summer. Between flavorful dishes from all cultures all over the world and lobster boils down south that gain popularity during Labor Day weekend, there are many delicious recipes for seafood. I’m going to share the five best seafood recipes. It was in November 2015 when I first discovered the whole fried fish recipe when I borrowed Rawia Bishara’s book from the library. The only recipe in this cook book that is great for a single person is a recipe called Whole Fried Fish, or Samak Maqleh (in Roman letters – from my Arabic studies… its written as مك مقلح which translates into “fried fish”). It serves four and takes four fish, so it was easy to calculate what I would need for one person. One fish, then divide everything else by 4. The author recommends using either red snapper, striped bass, branzino, porgies, or red mullet. I never really had these fish before, so I asked the fish monger at Wegmans what he would recommend. By law in Pennsylvania, he can’t sell striped bass because it’s a game fish, he didn’t have red mullet and had different snappers. The way he described the snappers, branzino, and porgies, I thought the branzino sounded the best and I bought one branzino. Back in April I had the chance to visit Chef Bishara’s restaurant, Tanoreen, in Brooklyn. I was returning from Toronto and flew into JFK airport. 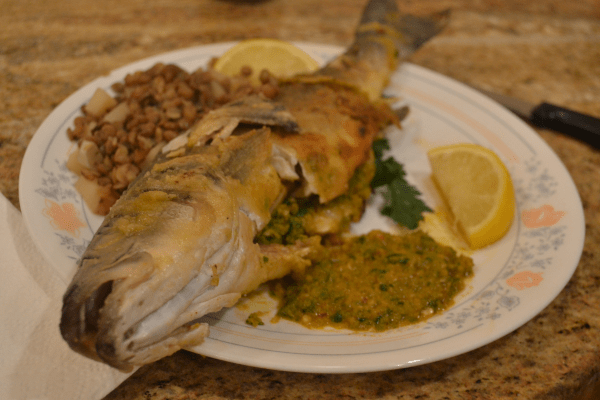 I had to go to Brooklyn to try Chef Bishara’s rendition of whole fried fish. While I don’t compare yet, I am happy Chef Rawia talked to all of her guests and she stopped by my table. I told her I loved her book and I loved making this recipe. She even gave me pointers on how to finesse my cooking. Spice the fish to your liking—add as much jalapenos or peppers to your liking. For the Tatbileh to stuff the fish with, the author suggested a bit of a spice with Jalapeno. I don’t like spicy and opted to use green bell peppers and an apple slice instead with cumin, paprika, and black pepper. Although it is time consuming, whole fried fish is simple to make! I was happy that the fish turned out well and that stepping out of my comfort zone to make this dish was a wonderful experience. I happily reported back to the produce stocker that the recipe was a success, which he was glad to hear as well. When I made it a second time for my parents, they enjoyed the dish as well. Rub the fish all over with salt under cold running water. Pat dry. Make the Tatbileh: mix all the ingredients in a food processor and pulse into a coarse mixture. Using a sharp kitchen knife, make three 1/8-inch deep crosswise slits along the length of the fish. Rub the Tatbileh into the slits and cavity of the fish. Set aside. Put the flour in a large shallow-rimmed plate. Dredge the fish in the flour, using a bit of flour to seal the cavity shut. Shake off any extra flour.Heat the oil in a large pot over high until hot. Fry the fish until it is golden on both sides, 2-3 minutes per side. Do not touch the fish until the underside is golden brown or the skin will stick to the bottom of the pan. Using a slotted spatula, transfer to a platter with the lemon halves, parsley, the left over tatbileh and lentils. I made lentils to go with the side. I made the lentils like how Nan used to make them – with garlic and some potatoes. So good and reminded me of just how Nan used to make them. Congratulations on the 5 Best Seafood Recipes article! I am a lifelong seafood lover and recipes #1, 2 and 5 are of particular interest to me. I recently had a whole fried fish dinner at a local restaurant and enjoyed it. I would be delighted to try the Feast of the Seven Fishes and Nan’s Baccalà. #5, the Sayadeya, also looks like the kind of dish I would appreciate. Thank you for these recipes, Jessica! You’re welcome, Shady! Please let me know if you try making any of these dishes because I would love to see how others make these dishes. All five of these dishes look and sound delicious. I appreciate the clear and complete instructions.